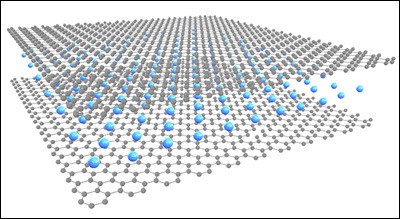 Transparent Conductor Beyond Graphene Limit. Schematic by Jiaqi Dai. If you see the word “graphite,” you might think of pencil leads. Graphite, one of the naturally occurring forms of carbon, is typically dark gray or black. Recently, however, a team of researchers from the University of Maryland Energy Research Center and Monash University in Australia has developed a nearly transparent, highly conductive ultrathin graphite sheet that can be used to create more efficient solar cells and highly sensitive touchscreens. The new material was introduced in the July 1, 2014 issue of Nature Communications. "Natural materials are designed in a way that there is nearly always a tradeoff between transparency and conductivity," explains Department of Materials Science and Engineering (MSE) graduate student Jiayu Wan, a member of MSE assistant professor Liangbing Hu’s research group. "For example, metals are very conductive but not transparent, while plastics can be transparent but are not very conductive." A growing number of products rely on a single material that must have both high conductivity and high transparency. Solar cells, touchscreens and flexible displays are among the things that require transparent electrodes in order to work. Wan, Hu, and their colleagues–including MSE research associate Wenzhong Bao and Monash/UMD Physics professor Michael S. Fuhrer–were able to simultaneously increase the conductivity and visible-range transmittance of ultrathin graphite by intercalating (embedding) lithium between its constituent layers of graphene, one-atom thick sheets of carbon known for their inherent strength, transparency, and conductivity. While intercalating molecules between layers of graphene to improve transparency has been accomplished before, this is the first time an increase in both transmittance and conductivity has been observed, and the first published results describing the use of lithium to do so. The team also believes the measurement techniques developed over the course of the work will enhance the study of the optoelectronic properties of other nanomaterials composed of two-dimensional layers. Bao, Fuhrer, Hu and Wan’s collaborators at Maryland included research associates Xiaogang Han (MSE) and Hongli Zhu (MSE); graduate students Xinghan Cai (Physics), Dohun Kim (Physics), Dakang Ma (Department of Electrical and Computer Engineering [ECE]) and Yunlu Xu (ECE); Assistant Professor Jeremy Munday (ECE and Institute for Research in Electronics and Applied Physics); and Research Professor H. Dennis Drew (Physics). Support was provided by the University of Maryland Energy Research Frontier Center, the U.S. Office of Science–Basic Energy Sciences, the Office of Naval research, the National Science Foundation, and the Australian Research Council.